I answer the phones at the office. It's part of my job description. Now, never mind that my phone is pushing 20 years old. This post is about something else. When I answer the phone, I say the name of the business and then, "This is Deb." I've been doing that for 14 years now (as of 1-10). In the past four years, we've been receiving, about two to three times a year, a phone call from some organization identifying themselves as the "Illinois Development Office". They have very heavy Asian accents and it's clear they are reading from a prepared script. The pitch, for the last four years, has been exactly the same. "Yes, hello. This is [pause] Kevin from the [pause] Illinois Development Office. We want to know if your business have found a new space or if you are still looking." The first couple of years, I was polite, but stern. "We are not looking." They would hang up immediately. Last year, I sighed and said, "Why are you calling us?" They hung up. Today, I got another call and I was not nice. I yelled at the woman, [pause] Janet (yeah right), "Take our name off your list, now!" Yelled. If you have ever heard me yell, you know I have a very loud voice when I yell and it gets louder when I am angry. This is nothing but a scam and I'm tired of dealing with this. The woman told me to listen to her as she wasn't selling anything. That made me even angrier. I yelled, "By law, if I order you to take this number off your lists you are required to do so. Stop calling us!" When she continued to say, "I am not selling anything. Just listen to me," I slammed the receiver down. What happened next is surreal. My boss was on the phone with the VP of the company. For the next 5 minutes, this company proceeded to call us and, when I answered the phone, hang up. When I didn't identify myself, you could hear the boiler room sounds of people making more robo calls in the background. 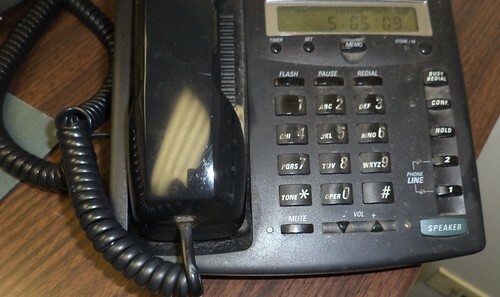 I found out from a friend that the computer programs they use to make these robo calls can be programmed to call repeatedly for a specified amount of time. They were trying to harass us. The VP heard the phone ringing in the background and wanted to know what the heck was going on. My boss traced the call to an unknown Internet source, while I got as far as "Paid Toll Free Caller". He tried to call the number back and it would not go through. They left us alone after 5 minutes. There are pages and pages and pages of complaints about this number. Most people say these are Filipino scammers. The little bit of reading that we did does not indicate how to stop them from calling. My boss said that if they call again, we will contact our phone company and ask for all numbers from that area code to be blocked. It reminds me of the copier scam. "Hi, this is Letitia from Copy Centers of America. I need you to verify the number on the front of your copier for me." When I ask why, they hang up on me. They want to sell you a maintenance plan. I have no time for them either and, in spite of my upbringing, I have no qualms about being rude to those callers either. I know it's a job, but you're calling me with a scam. They better be paying you five times what I make because you're not getting anywhere with me when I didn't call you about a problem. I'm passing this along. I don't know what, if anything, can be done, but this seems to be a pattern with this string of numbers. Several sites said the number last year was 882-013-0105 and the year before that it was 882-012-0105. I don't know what the scam is because I never let them get farther than their very bad question. I had the exact same call here in Toronto Canada. I think they called themselves the Canadian Development Office or something like that. Same phone number. 882-014-0105. Every time I ask them to take me off their list, I get a hang up. I just got the call myself in Vancouver, BC. Luckily they are calling my iPhone and there's a feature to block the caller. I believe these are robots and not real people phoning. Came across your post while trying to reverse look up this phone number. They just called me/my colleague (they have the number that rings on both of our phones) about 7 times, and my coworker twice told them to stop calling. The 6th call, my coworker asked for the caller's name and to speak to her supervisor, and the lady on the other end hung up. And on the 7th time the lady told my coworker to go f*** herself!!!! I just got a call from them as well, but this is not the first time. I was in the middle of saying, "can you please take me off your calling list" when they hung up on me. This is so infuriating because I did not call you, I did not bother you and you hang up on me?! I tried calling the number back and of course it didn't go through. On another note, I also had a copier service call me several days after buying a new printer. The man was very rude and demanding and when I asked why he wanted to know what model we purchased, he hung up on me. After some research, I found out that those people sign you up for some auto toner refill. So never give them any information! Oh yeah, the old copier scam. I've never considered looking at the number from which those originate. We used to get them once a month. A former employee nearly signed us up for toner refill but then remembered that he needed corporate approval for something like that and, when he said that, they hung up. I am usually less charitable. "Why do you need the number?" /click The best was, "Sweetheart," I said to a gal who called asking for the copier number, "can't you get a real job?" She replied, "How dare you!" So I shot back, "How dare you call my company with a scam? I didn't call you." She hung up. Thanks to persistently saying, "Why the hell do you need that number? ", the copier calls are about 2 a year. My business has been receiving calls from this number as well. They always say they calling from the Chamber of Commerce. Today I asked the lady why we keep getting this same call when our business hasn't moved and we're not looking. She said they send out the address change form (which I've never received). That's when I knew it was a scam. I asked her again why I've been receiving the same call for the past 8 months and she hung up on me. I came across your post when I googled the number. I'm glad to know I'm not the only one thoroughly irritated by these calls. Thanks Deb! I had the same thing happen to me, as the call the number listed on here http://www.webdesignandcompany.com/ MULTIPLE times per week. It's getting pretty silly. We run a small SEO company in St Louis, and have no need of anything they offer. Did you ever get them to stop calling? If so, HOW? Since this post, we haven't received a call from them. It's rather interesting that, as far as we can determine, our office is the only office in our company which has received these calls. My company has 20 offices spread out across the US and we're the only ones who at least admit to receiving these calls. The VP who was on the phone when this madness occurred recommended calling our phone company (AT&T) and getting the number blocked. Because they haven't called back, it's not a high priority in the grand scheme of daily work. We did discuss talking to whomever calls and saying, "Yes, sure, we're looking" just to see what the scam is. I can't remember where I read it, but someone posted that they went to their state Attorney General and were met with a heavy sigh. These people change their number so quickly that, by the time the wheels of consumer protection start rolling, they are gone. Plus, because the number originates outside the US it seems, stopping it involves cooperation with a foreign government. I don't see the Philippines moving "stop robo calls" to the top of their to do list. As our calls have tapered off, it might simply be persistent, "Stop calling" and hanging up on them, that gets them to quit calling. I would think the return on investment would be so low that you'd move on to someone else and quit calling people who hang up in your ear. Just received a call from this number and the lady had a heavy accent. She described herself as "New Jersey Business Development Office". Information in your blog is very useful. The caller number of 882-014-0105 does not seem to work and may be "spoofed" so they can hide who they are. We got a call yesterday and another just now. Last year we got calls like this and I think it is the same scammers. They wanted to confirm my company address. When I asked who they are they said it was the chamber of commerce. When I asked which one they hung up. I am reporting all of these calls to the FTC at 888-382-1222. Even if you have a business you should report all scams like this. While I have a business, they called my home phone. Called me today in Vancouver. Said they were from BBB, and checking to see if we had found a new office space yet. Funny thing is, we have been looking recently, but I think that's just a coincidence. Yeah I just a call right now from this number its 3/18/14 @ 3:10pm PST. And they came to be from the better business bureau. I typed they're number on google and came across this page. They were asking if we (the company) was planning to move, are looking, or have found a place. I asked why would BBB be interested in that? ( 'cause it sound like a call for farming telemarketer info). The guy said its for like a survey or annual review or something. I said well I notice you number and I don't know if you're just farming for information but please dont... and before I can finish my sentence to ask not to call again, the guy hung up.